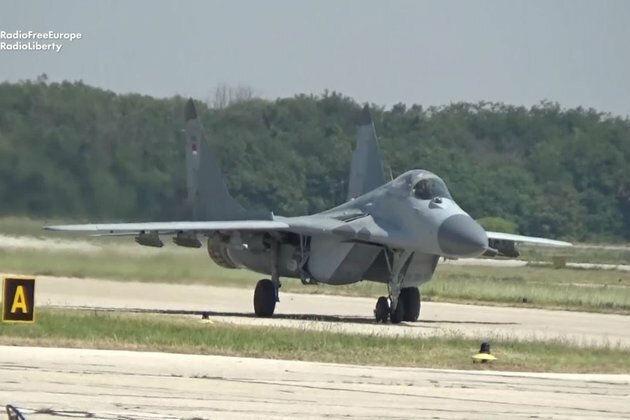 Serbia has taken delivery of two Russian MiG-29 fighter jets -- the first of six planes that are part of an arms deal between Belgrade and Moscow. Serbian President Aleksandar Vucic attended the ceremony on August 21 at a military airport close to Belgrade. Russia has donated Serbia a total of six secondhand MiGs and the two that flew on August 21 have undergone extensive repair by the Russians as part of the deal. Produced between 1989 and 1991, the warplanes are somewhat newer than Serbia's four existing MiGs -- which were delivered in 1987. Serbia claims military neutrality and formally wants to join the European Union. But it is also negotiating additional arms purchases from Russia, including attack and transport helicopters, Buk-M1 and Buk-M2 air-defense missile systems, and Tunguska antiaircraft systems.